We're sorry, but we no longer have this item in stock. 403 other birds have this item in their bag or wishlist! Put your best and most comfortable foot first in a pair of Gizeh Thongs from Birkenstock. Make onlookers envious as you stroll through the park with effortless style, entirely at ease! The fine construction of the Gizeh thong is specifically developed for the deep footbed, and corresponds perfectly to the anatomy of the foot. The Birkenstock thong guarantees an ideal fit, it naturally surrounds the toes and guides them back to their natural position. We stock Birkenstock in regular width only. It is important to measure your foot to find the best fit. Measure the length of your foot by standing with your heel against a wall and measure from the wall to the tip of your longest toe, then add 10mm for movement. Measure the width across the broadest point. Shoe measurements (length mm x width mm) - 36: 230 x 91, 37: 240 x 93, 38: 245 x 95, 39: 250 x 97, 40: 260 x 99, 41: 265 x 101. If you have any other styling or sizing queries, we would love to hear from you at customerservice@birdsnest.com.au, at our Facebook page, or through Twitter. Gorgeous red and very comfortable. Size is perfect! Will definitely be ordering them again in just another colour. Well this is my first ever pair of birkenstock sandals and they are just sooooooo comfortable. They just mould to my foot beautifully. I don't want to ever take them off. I will most definitely buy more. Love these shoes and in particular the colour. Great fit and colour. So comfortable! I'd been looking at this colour and model at a local shop but they didn't have my size. Then I thought to look up Birdsnest and was so happy when I found the size I needed in this beautiful colour. The cherry is such a lovely shade of red. Have thought about buying a pair of these for years - so glad I did. These are so comfortable and true to size. I'm going to buy another pair very soon! Love the colour, long time purchaser of Birkenstock, v comfy. No, I would not recommend this item. Always a great shoe and they last for years if you look after them. Haven't taken them off. Can't wait to get another pair in a different colour and style. I think I would have preferred the strap to be made of leather though. Great for this hot weather! Great colour and extremely comfortable. The size is perfect. A little disappointed that the red strip is not leather. Well Birkenstocks speak for themselves. Extremely comfortable!! This is my second pair of Birkenstock. I have the same style in silver and wear them all the time in summer - those shoes are 6-7 years old now. Thought I'd splash out on a new pair and have been eyeing the cherry red for a while. Very happy with my purchase. Typical Birki's!! Soooo comfortable. I pull them straight out of the box and put them on....no need to break them in! Have these in several colours. Love these Birkenstocks, very comfy, great colour.. have them in black too. 1 found this review helpful, 0 did not. This is my very first pair of Birkenstocks and when I first wore them my feet nearly cried out to me to stop - I thought, oh no! Maybe these shoes aren't for me!! But then I persisted and wore them for a couple of hours each and every day and now they're sooooo comfortable! This is my fifth pair of Gizeh Thongs and I love them. They arrived super quickly and fit perfectly! 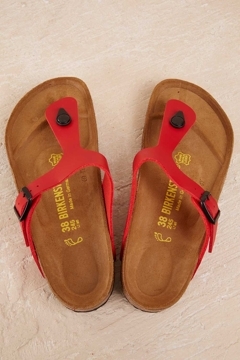 Birkenstocks always great shoes - & love the red! How long have these Birkenstock thongs been in Australia? I'm sure I bought my first pair 20 years ago but they're such a reliable style and trustworthy brand, my new red pair are as good as the first. Wear these at some point every day they are very comfy and easy on the feet. I love these! Super comfy, true to size and best of all, they are kind to my wider foot! 2 found this review helpful, 0 did not.